Hand-thrown white eartherware cup with rolled and modelled feet. Glazed with accents of cream and finished with raised dots filled with blue runny crackle glaze. Bring some cheer to your breakfast table with these adorable eggcups but be careful that they don't run away with your morning egg! An ideal gift for a little boy or girl. 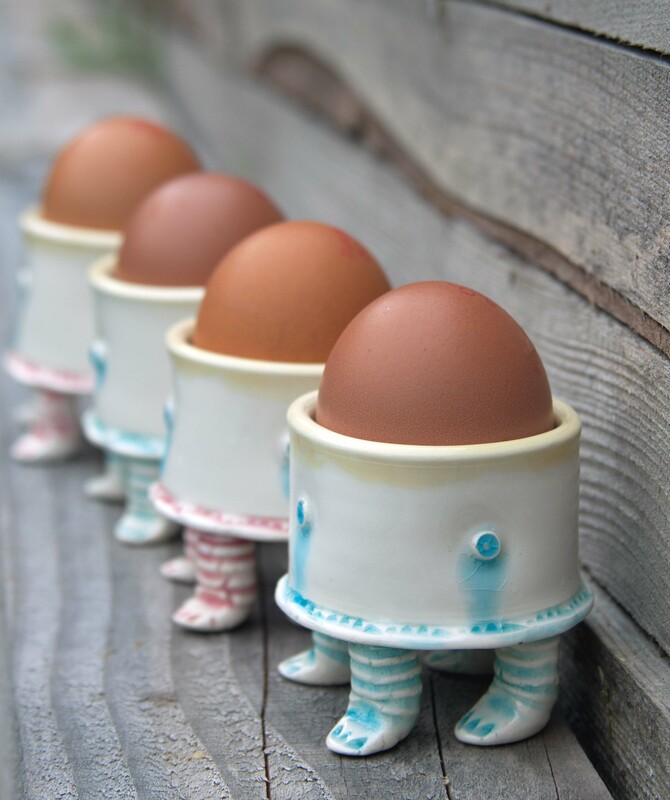 These egg cups can be purchased as singles with blue or pink feet or as a pair with one of each colour. 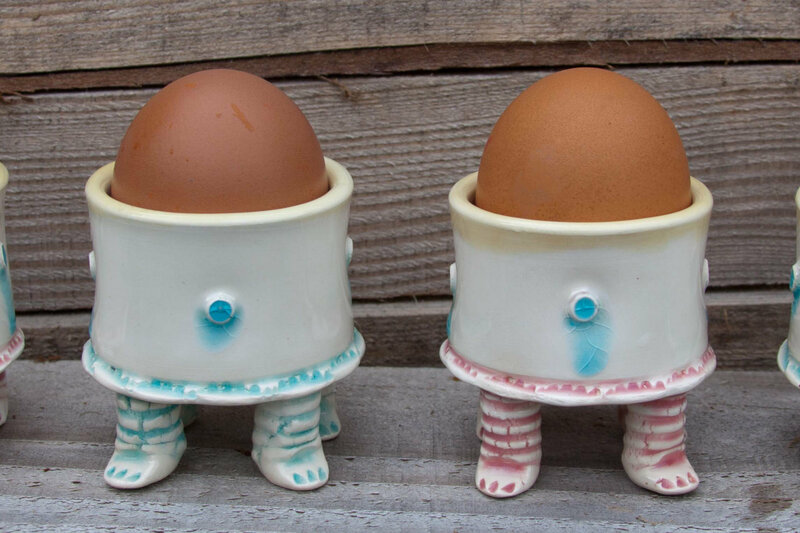 A pair of fun egg cups one with pink feet and one with blue feet. Hand-thrown white eartherware cup with rolled and modelled feet. Glazed with accents of cream and finished with raised dots filled with blue runny crackle glaze. Bring some cheer to your breakfast table with these adorable eggcups but be careful that they don't run away with your morning egg! A ideal gift for a little boy or girl. Hand-thrown white eartherware cup with rolled and modelled pink feet. Glazed with accents of cream and finished with raised dots filled with blue runny crackle glaze. Bring some cheer to your breakfast table with these adorable eggcups but be careful that they dont run away with your morning egg! A ideal gift for a little boy or girl. Hand thrown white earthernware cup with rolled and modelled blue feet. Glazed with accents of cream and finished with raised dots filled with blue runny crackle glaze. Bring some cheer to your breakfast table with these adorable eggcups but be careful that they don't run away with your morning egg! A ideal gift for a little boy or girl.